Two weeks before the space shuttle Columbia exploded during reentry to Earth's atmosphere, astronaut Ilan Ramon "saw" an unusual occurrence  a quick red flash in the upper atmosphere. Although it could not be seen with the naked eye, a specially-filtered camera lens was able to capture the instantaneous flash, which may help scientists understand lightning activity and the chemistry of the upper atmosphere. Ramon and his camera were part of the Mediterranean Israeli Dust Experiment to aid in long-term climate and weather forecasting, one of the various scientific missions carried out on Columbia. 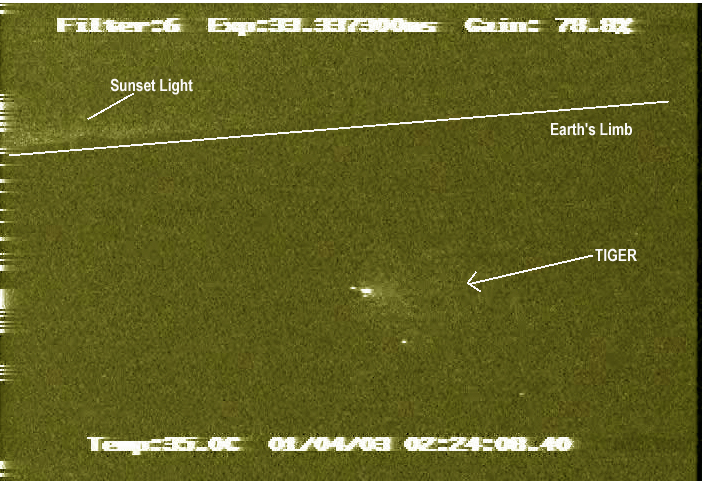 Despite the tragic loss of the shuttle and its crew, satellites and computers were able to return some data to the scientific world, including information about the new upper atmosphere lightning. Lightning that strikes upward toward the atmosphere, rather than toward Earth, is known as a transient luminous event. The flash of red light, recorded just south of Madagascar over the Indian Ocean however, does not seem to resemble any known transient luminous event, and researchers have named it a Transient Ionospheric Glow Emission in Red, or a TIGER. "What we saw was new stuff, which surprised us," says Yoav Yair, a scientist with Open University in Israel and lead author on a paper published in Geophysical Research Letters this month. In the two years since the loss of Columbia, Yair and his colleagues have been studying the event, watching the videotape hundreds of times and trying to decipher what may have triggered the flash. They have ruled out the possibility of a camera glitch or a shutter phenomenon, but have not come to any definite conclusions. From the space shuttle Columbia, this image depicts a previously unobserved phenomenon in the upper atmosphere, a Transient Ionospheric Glow Emission in Red, or TIGER. Image courtesy of Yoav Yair, Open University. The TIGER is unique because "it was very far from any thunderstorm in the area," Yair says, and "it's much dimmer and faster" than other lightning-related phenomena. Sprites, another type of transient luminous event that produces a dim red flash associated with lightning, are delayed only 10 milliseconds after a lightning strike and appear approximately 40 kilometers away, which is the average displacement. The observed TIGER, however, was delayed 0.23 seconds from any preceding lightning strike, and was more than 1,000 kilometers away from the nearest lightning, leading the international team of researchers to believe that it should be classified as a completely different type of transient luminous event. The team has noted several options as to what generated the TIGER, including extraterrestrial sources such as meteor trails and mini-comets. Lightning and thunderstorm activity also have not been completely ruled out, and the authors are considering several possibilities, such as lightning-induced electron precipitation, which causes bursts of energetic electrons that affect the ionosphere (the outer region of the atmosphere that is characterized by an abundance of free electrons). The next step, Yair says, is to look for more TIGERs in the sky. The International Space Station, which has the cameras and equipment to do it, would be an ideal starting point, he says, but funding agencies need to say that the imaging is a scientific priority for understanding the global electrical circuit and the chemistry of the upper atmosphere. Currently, satellites are observing transient luminous events, but have not observed any TIGERs. In the next couple of years, there will be more space platforms to monitor this type of phenomena, Yair says. "This region of the atmosphere is not commonly observed," he says. "Perhaps we'll find more TIGERs."